Marty bell has spent most of his adult life acting as a catalyst and activist for the improvement of student’s educational experience. Now, he’s running for school board! Friend’s of Marty Bell for School Board were referred to Contemporary Websites by previous clients because they knew we were the right people for the job. Having past experience designing a campaign for an individuals running for public office, Contemporary Websites understands the importance of getting the correct message across for a multitude of visitors hoping to gain information on the candidate, the candidate’s position on issues, and support and volunteer opportunities. 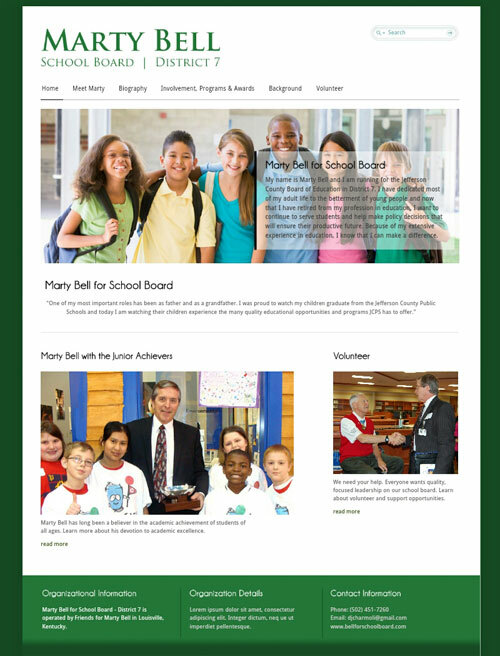 This site is no longer live – click the image to view the design larger.